This entry was posted in Word 365 ProPlus Greek and tagged Automatically Show Me Design Ideas, backstage view, Designed Layouts, File, How To Activate PowerPoint Designer, Αρχείο, Αυτόματη Εμφάνιση Ιδεών Σχεδίασης, Διαφάνειες, Επιλογές, Επιλογές Του PowerPoint, Ενεργοποίηση ή Απενεργοποίηση του Χαρακτηριστικού Ιδέες Σχεδίασης Στο PowerPoint, Ενεργοποιήστε Τις Αυτόματες Προτάσεις, Προβολή Backstage, Παρουσίασή, Σχεδιαστής, Microsoft Office, Microsoft PowerPoint 365, Office Smart, Office System, OfficeSmart, Options, Or Ask For Design Suggestions Any Time By Clicking Design Ideas On The Design Tab, philippospan, Slide, Smart Office, smartoffice, Subscribe, Turn On Automatic Suggestions From PowerPoint Designer Here, YouTube, YouTube Channel. This entry was posted in Word 365 ProPlus English and tagged Automatically Show Me Design Ideas, backstage view, Designed Layouts, File, How To Activate PowerPoint Designer, Microsoft Office, Microsoft PowerPoint 365, Office Smart, Office System, OfficeSmart, Options, Or Ask For Design Suggestions Any Time By Clicking Design Ideas On The Design Tab, philippospan, Slide, Smart Office, smartoffice, Subsribe, Turn On Automatic Suggestions From PowerPoint Designer Here, YouTube Channel. This entry was posted in Word 365 ProPlus Greek and tagged Adjust, Format, From A File, From Clipboard, From Icons, From Online Sources, How To Change A Picture in PowerPoint, Icon Gallery, Από Αρχείο, Από Εικονίδια, Από Ηλεκτρονικές Πηγές, Από Το Πρόχειρο, Εργαλεία Εικόνας, Εικόνα, Μορφοποίηση, Να Καταργήσουμε ή Να Αντικαταστήσουμε την Επιλεγμένη Εικόνα, Προσαρμογή, Πώς Να Αλλάξουμε Μία Εικόνα Σε Διαφάνεια Του PowerPoint 365, Microsoft Office, Microsoft PowerPoint, My YouTube Channel, Office 365, Office Smart, OfficeSmart, philippospan, Picture Tools, PowerPoint Presentation, Remove Or Replace the Selected Picture, Slide, Smart Office, smartoffice, While Maintaining The Size And Position Of The Picture Object. Many times, we have inserted a Picture in a Slide on our PowerPoint Presentation and the last minute we change our mind about that Picture. What do we do? 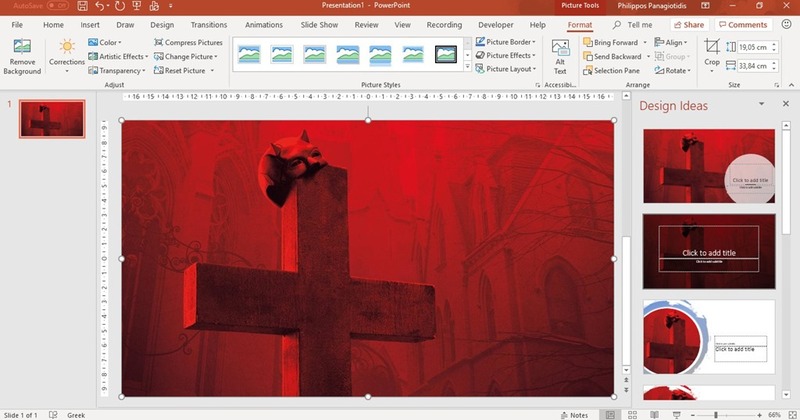 Well PowerPoint 365 has a quite easy and helpful feature available where we can Change the Picture in just a couple of seconds. All you need to do, so you can find out how it works is to continue reading this post. 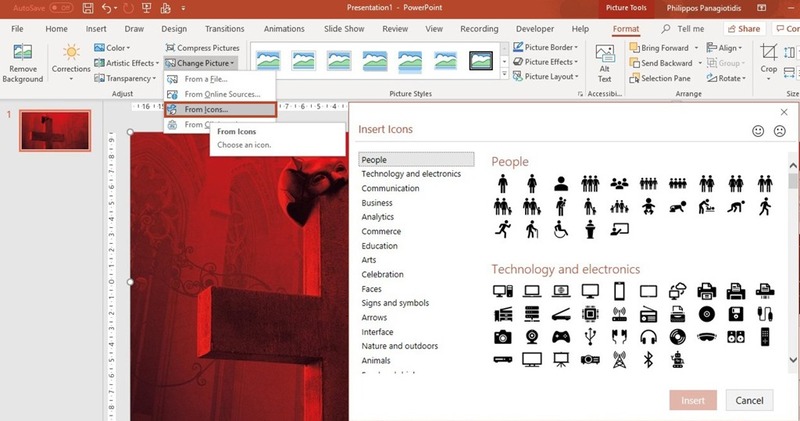 Once we select an image in PowerPoint that we have inserted in our Slide, the Picture Tools main tab is activated. The Format tab also appears on the ribbon as shown in the image below. Once the Format tab appears and is activated, we locate the area of the ribbon named Adjust which is at the left area of the ribbon. In the area Adjust of the Format tab, we locate the command Change Picture as shown in the image below. By using this command, we can Remove Or Replace the Selected Picture, While Maintaining The Size And Position Of The Picture Object. From A File: By selecting this command we can browse for a picture from our computer or local network. Once selected, the Insert Picture window will appear, where we just locate the picture that we want. From Online Sources: By selecting this command, we can browse for a picture from a variety of online sources. Once selected, the Online Pictures window will appear, where again we just select the picture that we want. From Icons: By selecting this command, we can choose an icon from the Icon Gallery. Once selected the Icon Gallery window will appear, where we just select the icon that we want. 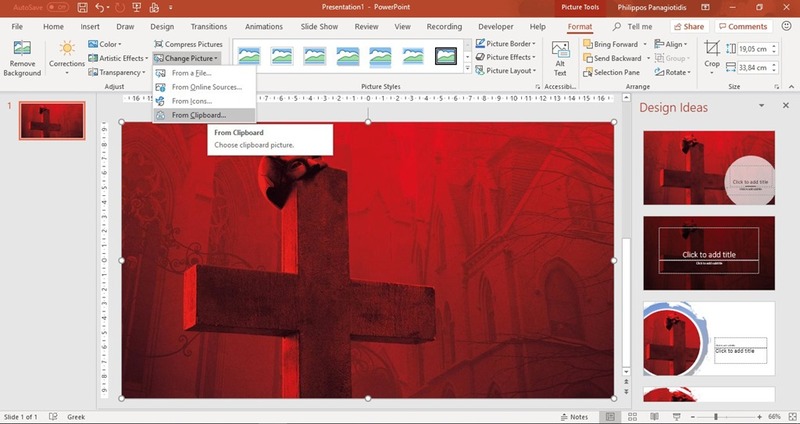 From Clipboard: By selecting this command, whatever we have copied in our Clipboard, will be inserted and replaced the existing image in our PowerPoint Slide. I believe that it is a very easy and quick way to replace an Image in a PowerPoint Slide. The same procedure is the same to change a Picture in the Microsoft Word, Microsoft PowerPoint and Microsoft Outlook applications. 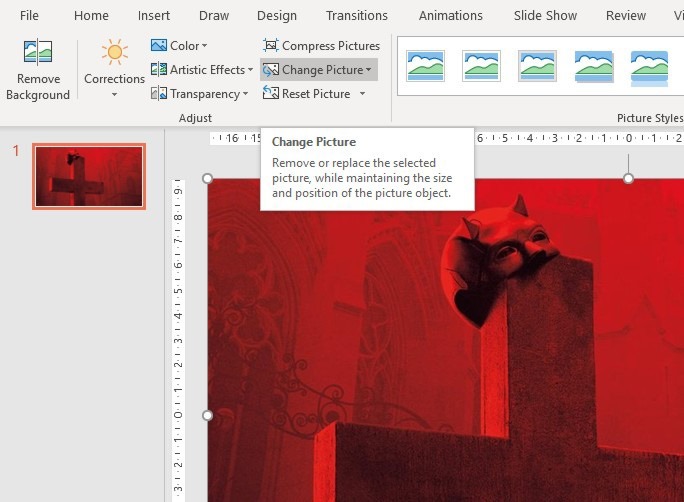 Below you can check out the video describing How To Change A Picture In A PowerPoint Slide. This entry was posted in Word 365 ProPlus English and tagged Adjust, Format, From A File, From Clipboard, From Icons, From Online Sources, How To Change A Picture in PowerPoint, Icon Gallery, Microsoft Office, Microsoft PowerPoint, My YouTube Channel, Office 365, Office Smart, OfficeSmart, philippospan, Picture Tools, PowerPoint Presentation, Remove Or Replace the Selected Picture, Slide, Smart Office, smartoffice, While Maintaining The Size And Position Of The Picture Object. This entry was posted in Word 365 ProPlus Greek and tagged Apps And Quizzes, Audio, Audio On My Pc, Auto-Play Media, backstage view, Commands Available on the Recording tab in Microsoft PowerPoint 365, Content, Current Slide, Edit Mode, Export To Video, Ήχος, Ήχος Από Τον Υπολογιστή Μου, Αποθήκευση, Αποθήκευση Ως Παρουσίασης, Αυτόματη Αναπαραγωγή, Αυτόματη Αναπαραγωγή Πολυμέσων, Βίντεο, Διαφάνεια, Διαθέσιμες Εντολές στο Tab Εγγραφή στο PowerPoint 365, Εφαρμογές και Τεστ Γνώσεων, Εγγραφή, Εγγραφή Ήχου, Εγγραφή Από την Τρέχουσα Διαφάνεια, Εγγραφή Από Την Αρχή, Εγγραφή Παρουσίασης στο PowerPoint 365, Εξαγωγή Σε Βίντεο, Καταγραφή Οθόνης, Οθόνη Καταγραφής Παρουσίασης, Πρόσθετα του Lab Office, Περιεχόμενα, Πολυμέσων, Στιγμιότυπο, Microsoft Excel, Microsoft Office, Microsoft Outlook, Microsoft Word, Office Smart, Office System, philippospan, PowerPoint 365, Pptsx, Presentation to Exported As A Video, Record, Record From Beginning, Record From Current Slide, Record Slide Show, Recording Tab in PowerPoint 365, Save, Save As Show, Screenshot, Slide, Smart Office, Video, Windows, YouTube Channel. In PowerPoint 365, we can add now a Recording tab to the ribbon which is available. We can then create a Presentation made up of recorded slides, screen recordings and inserted Videos and finally share the Recorded Content to be viewed. We can even make our Presentations more interactive by embedding quizzes to assist. We can even change the ink color right from the pane in the recording pane. In order to learn more of the Recording tab in PowerPoint 365, with all the available commands just keep on reading. This entry was posted in Word 365 ProPlus English and tagged Apps And Quizzes, Audio, Audio On My Pc, Auto-Play Media, backstage view, Commands Available on the Recording tab in Microsoft PowerPoint 365, Content, Current Slide, Edit Mode, Export To Video, Microsoft Excel, Microsoft Office, Microsoft Outlook, Microsoft Word, Office Smart, Office System, philippospan, PowerPoint 365, Pptsx, Presentation to Exported As A Video, Record, Record From Beginning, Record From Current Slide, Record Slide Show, Recording Tab in PowerPoint 365, Save, Save As Show, Screenshot, Slide, Smart Office, Video, Windows, YouTube Channel.